Ireland's pubs and beer are legendary, but the country's traditional drinking holes are experiencing a new phenomenon - the 12 days of Christmas have turned into the 12 pubs of Christmas... visited all in one night. To pass the threshold of a true Irish pub is to enter a blessed world far from our darkest, modern woes. The burgundy colours of wood along with the stained and etched glass create a comforting, seductive atmosphere. After four years spent real-pub-less abroad, I have returned to Ireland for the run-up to Christmas, my throat almost cracking with emotion, it emits the magical words: "Two pints, please." The barman pours my pint slowly, with thought, and rests it on the long, stony counter together with others nestled on the bar like debutantes awaiting their first dance of the night. My thirst quenched by the sweet, burnt, velvety black liquid, I notice the sounds and lights of the pub, the low mahogany tables and fire glowing in the hearth - a warm bower concealed from the icy storm outside. But suddenly, a hollering collection of young yahoos in garish Christmas jumpers adorned with flashing lights descends and I am abruptly jolted out of my reverie. What on earth are they doing in what is affectionately known as an old man's pub, bereft of loud muzak, glassy fixtures, and wall-to-wall TVs? Their presence jars insanely with the aged, nicotine-consecrated walls I love so well. "That will be the 12 pubs of Christmas brigade," explains my patient companion. "They go from pub to pub taking a drink in each - 12 like the Christmas carol. Instead of the 12 days of Christmas it's visiting 12 pubs in one night. For the last three years it's grown to be a tradition in Ireland and is now massive." We adjourn to a quieter pub but again find more seasonal sweaters and foolhardy souls up for the 12 pubs challenge. This group of about 20 from University College Dublin who have finished their exams are relatively quiet and considerate. "First you plan your route of 12, then you agree on rules," says one of them, John Hanney, who is on his sixth Guinness of the night. Rules? "Oh yes, we have to have rules - for the banter, for the craic." As for the route there are, rather like the 12 days of Christmas song itself, local variants and adaptations. "The standard route in Dublin is to start at Upper Baggot Street, in the southern suburbs, and end up in Town - Grafton Street or even Temple Bar," adds Hanney referring to what's known as the Baggot Street Mile. Dublin seems to be taking this mass phenomenon in its stride, perhaps because many, despite starting as early as 5pm, simply don't always manage the full monty. Newsagent Dave Collins only reached six drinks last weekend. His excuse: "Distractions, like pretty girls, and the slow pace of some. The Irish are not fond of rushing as you know. 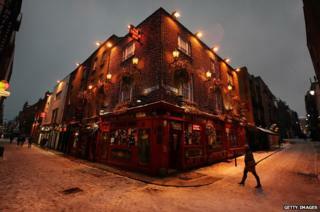 "The 12 pubs offers us an excuse, and likewise our wives, to get together for an occasion. Do we do the 12? Does anyone? Probably not. With the distractions of modern life it's a welcome 'official' night out." I couldn't find anyone in Dublin against the 12 pub challenge but the Irish health authorities warn about the harmful effects of heavy drinking. "There remains a consistent trend for drunkenness among young Irish people," reads a statement from Alcohol Action, an Irish charity for alcohol-related issues. "Until we legislate to protect them by addressing the pricing, availability and marketing of alcohol in Ireland then we will continue to see many of them drinking in a way that is harmful to their health and wellbeing," it warns. While just over a third of the Irish population binge drink, 25% never drink alcohol at all, according to a survey by the Health Research Board of Ireland. Perhaps the biggest casualty of what some see as 12 pubs "faux, forced-craic" is the dignity of these lovely old pubs themselves. The Real Irish Pub (RIP) is under threat from commercialisation and the curse of wall-to-wall sport on flatscreen TVs that loom incongruously among the still-pots and shillelaghs (traditional sticks or cudgels). But, by God, the stout is mighty and while the 12-pubbers come and go, the pub abides. When drinking, you hear the blessing of good health, "Slainte!" And I often add a silent prayer of my own: "Please, if there is a God, make him Irish and never take this away."